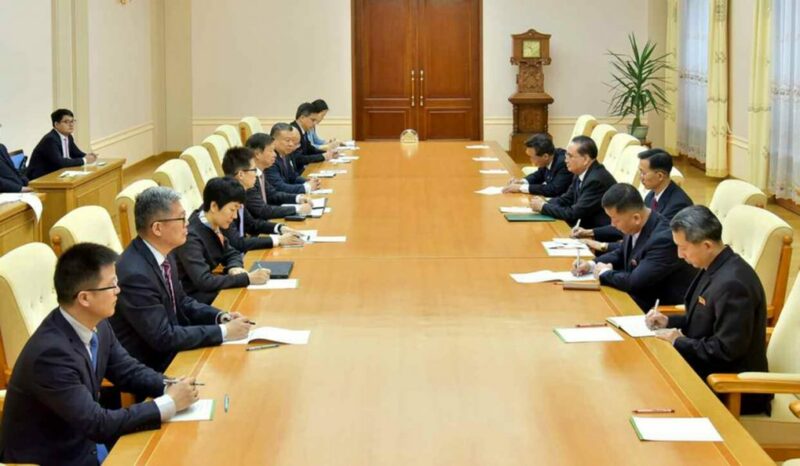 Ri Su Yong and officials of the WPK International Affairs Department (right) meet with Song Tao and PRC officials in Pyongyang on April 14, 2018 (Photo: Rodong Sinmun). Workers’ Party of Korea [WPK] Vice Chairman and WPK International Affairs Department [IAD] Director Ri Su Yong (Ri Su-yo’ng) met with Song Tao, Director of the Communist Party of China [CPC] International Liaison Department Director on April 14 (Saturday). Also in attendance were IAD Deputy Director Ryu Myong Son (Ryu Myo’ng-so’n), PRC Ambassador to the DPRK Li Jinjun and other IAD officials.